It costs, on average, £5 per week to look after a hedgehog. A sick hog that needs large amounts of medication can cost considerably more. During the winter of 2009-2010 our weekly bills were running at over £200 and this just keeps increasing as more and more hedgehogs arrive. As a result we are looking to set up a team of Friends who can take on some of the fundraising tasks. Every opportunity to promote the Charity and raise money is seized and to achieve this we need committed support. There are many fetes, car boots and fairs to attend during the summer and early autumn and we need to make the most of these as winter is our busy time. We would also like to be able to hold events ourselves e.g. car boot sales and jumble sales. With an efficiently organised group of supporters, we could do them all and encourage people to develop anything that particularly inspires them. Anyone into long distance running? Short distance running? A walk? Slow crawl? We can give advice on anything that you might like to have a stab at and, by working as part of a team, no-one need disappear under the workload. If you are interested in helping us in any way, please contact us on 01635 826120 or fill out our contact form to discuss how you can become involved. 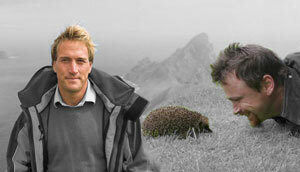 It's great fun, satisfying, and if you're really lucky, you might get to meet Hugh Warwick or Ben Fogle both of whom support hedgehogs at every opportunity. If you buy online, easyfundraising allows you to donate to us with each purchase at no cost to yourself. When you search using easysearch our cause will receive about a penny for every search you make. This soon mounts up.